Dr. Brian Wilson PhD is a Senior Scientist at the Ontario Cancer Institute and Professor of Medical Biophysics at University of Toronto. He leads an internationally recognized R&D program in optics-based biomedical applications, with a primary translational/clinical focus. In the past five years, the convergence of optics, nanotechnology and biomedical sciences has been an additional thrust. Dr. Wilson has published 300 peer-reviewed papers in basic, translational and clinical research, and has trained more than 60 graduate students and postdoctoral and clinical Fellows. 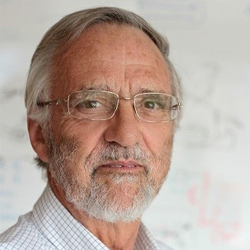 He has held/holds several international Visiting Appointments (Harvard, USA; Saõ Paulo, Brazil; Fujian, China; Western Australia) and is involved in many national and international collaborations. In the 1990s, Dr. Wilson established the Laboratory for Applied Biophotonics at UHN, a unique partnership model between R&D institutions and industry, and founded and co-directs the Advanced Optical Microscopy Facility at UHN. He has co-founded 2 companies and has served on/chaired the Scientific Advisory Boards of several SMEs and multiple institutions in Canada and internationally. Currently, he serves as Vice Chair of the Advisory Committee on Research for the Canadian Cancer Society Research Institute. He holds several awards in biomedical optics (Mark Award, NIH Translational Research Award) and cancer research (Robert L. Noble Prize). In Techna, he serves as the Scientific Lead for the Photonics platform.